The OFI 400 model Identifier is equipped with a unique two-position head design that can be configured to work with 250 µm, 900 µm, ribbon, or jacketed fiber in seconds, without tools or adjustments. When testing coated fibers, the slim design of the OFI 400 model allows easier access on a splice tray where the amount of work space is limited. The clamping trigger is ergonomically designed to fit the natural motion of the operator’s hand. A high impact molded plastic case makes the OFI 400 model suitable for use outside plant or in the central office. The OFI 400 model Identifier is the next generation of Noyes Optical Fiber Identifiers. It has all the features of the OFI 200 model plus easy-to-read LCD display with Backlight, multiple [TONE] signal detection (270 Hz, 330 Hz, 1 kHz, or 2 kHz), power saving feature, and [Set Reference] feature. 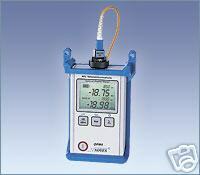 The OFI 400 model also measures and displays fiber core power or relative power on an LCD display. The OFI 400 model Identifier is battery operated with the battery indication feature and performs thousands of tests before batteries replacement is necessary.